Hi-Tech Training offer City & Guilds Certification courses in the technical training areas Analogue and Digital Electronics, IT Customer Support, Computer Maintenance and Computer Networking. These courses are accredited by City & Guilds of London Institute for Certification (see illustration below for certification route and progression). Each of these internationally recognised City and Guilds courses incorporate approximately 50% practical “Hands-On” experience. Successfully completing a particular combination of courses can lead to the City & Guilds Internationally recognised Diploma in IT Systems Support (7267-24). 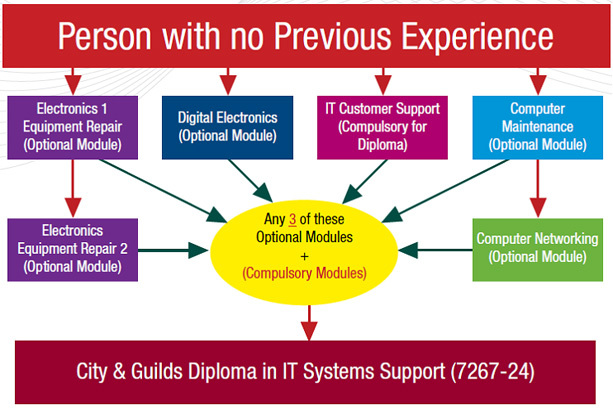 To achieve full certification for the IVQ (International Vocational Qualification) Diploma in IT Systems Support, learners must complete 4 units, comprising one core (shown in Red), plus three optional units from the choice shown in the table, below. A City & Guilds Certificate will be issued for each successfully completed unit. Practical “Hands-On” experience: – 50% approx.